After a long rehearsal, you put your flute away and catch sight of your face in the mirror and see your chin has a black or grey patch. It washes off easily enough but when you ask about it on-line, you are told it may be an allergy to the metal of the flute. Eek! What to do? Well first relax. Black Chin is well known among flute players and nothing to worry about. Look Close, Very slight grey mark on chin - Mark can be large and dark or small and unnoticeable. People with metal allergies (those who actually ITCH or develop a rash) may want to put a lick-and-stick postage stamp (don't use the self adhesive ones) on the lip plate or use a "lip plate patch". Lots of music catalogs carry them. Black Chin - This is when your chin turns black or grey after playing the flute. It can be a small minor mark (like the photo above) or a large smear that covers your chin. As long as the discoloration rubs or washes off and you don’t itch, it is NOT an allergy. It is a reaction between your skin’s PH balance and the metal of the flute. It is not dangerous, just annoying. It can happen with almost all metals, even sterling silver. Gold and wood head-joints are the main materials that don't cause this but both can be pricey (and a few people still get black chin with these). This is why some people will tell you to get your lip plate plated with gold (although I wouldn't spend the cash on something that may not prevent black chin especially since plating wears off over time). Everyone’s personal PH is a little different so some people get black chin often and other people never seem to get it at all. Heat, humidity and sweat also impact how your skin and metal interact so some days the whole flute section has black or grey chins and other days only one player does. A common misconception is that only white women get black chin but that just isn't true. What is true is that the darker your skin is, the less visible the mark is and men with beards rarely even notice when their beards turn just a little darker. Plus, most make-up and some lotions dramatically increase the amount and frequency of black chin. Which means people who wear make-up or lotion (mostly women in this day and age) are much more likely to have noticeable discoloration on their chins. And male and female teenagers alike should keep in mind that some acne treatments may aggravate black chin or even take the finish off your flute so washing your chin before playing is highly recommended! Finally, if you polish your head-joint, you will almost always get black chin the next time you play (or several times). Since silver polish isn't actually good for flutes (or you; it can cause your skin to break out and getting it in your mouth isn't so great either), skip the polish and just clean the flute with a soft dry cloth. --spend $1000 or more on a wood or gold head-joint (not recommended for most student and starving musicians and doesn't work for a few people). --don't wear make-up on the lower half of your face when playing to minimize the issue (lipstick, foundation, moisturizer, lip-balm, acne treatments - all should be washed off before playing). --keep a rag handy to wipe your chin off (works best when you have frequent rests in the music and can become distracting to the audience if done too frequently). --put a cheap lick-and-stick postage stamp (don't use the self adhesive ones) or "lip plate patch" on the lip plate. --just don't worry about it. 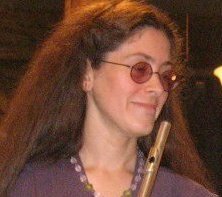 The majority of the audience won't notice and those who do usually assume (correctly) that it is an ordinary flute thing. Tell the few who ask that it’s a badge of excellent flute playing. Raise your black chins high with pride! P.S. I have recently run into the suggestion of painting the lip plate with clear nail polish to avoid black chin. Let me just say, please don't! Removing the polish without damaging the flute can be tricky especially if your flute is plated. I wouldn't want to risk nail polish remover reacting with the metal and obviously scraping it off is a terrible idea. And you will almost certainly want to remove the nail polish someday - when you get a new flute, when the nail polish starts to look bad, when your teacher has a hissy fit over the nail polish etc. A repair person may be able to remove it. Or they may have trouble if your head-joint is not made from a solid precious metal (silver or gold). It is a risk I wouldn't want to take. And if you got here looking for ways to deal with acne on your chin caused by silver polish, I do feel for you. It can be very painful. The best advice I have is don't use silver polish on your flute. If that ship has sailed, don't despair. The polish will clean off eventually. Just wipe the head-joint and lip plate off with a soft dry cloth, GENTLY, before and after you play for the next week or so. And wash your face before AND after playing to reduce the issue as best you can. And if you have an allergic reaction (itching or pain), go to a doctor for advice on how to recover! And look into using a lip plate patch.